Create a new look in your room with the 12 Light Crystal-Like Large Stardust Birdies Ring 120 x 180 Round Large Chandelier ... 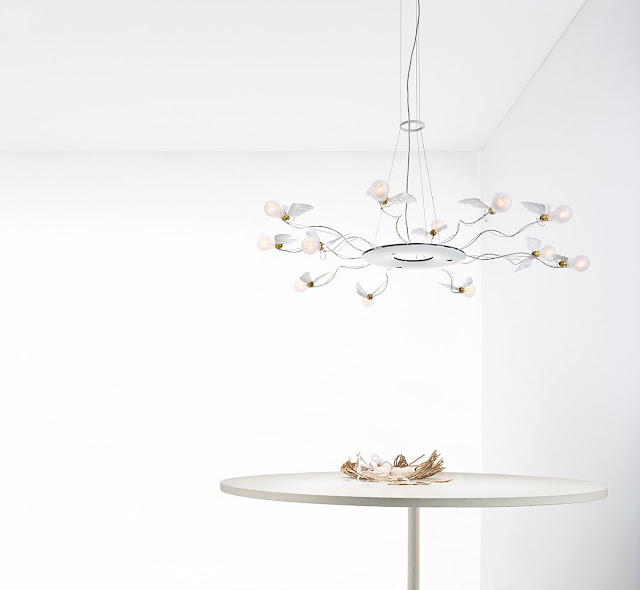 The Chandeliers - Modern Chrome / Birdie Round chandelier - 100% Birdie's Ring by ingo maurer und team 2013 from Stardust. Round suspension lamp (chandelier) with 12 special halogen bulbs, each 10 w, produced exclusively for ingo maurer gmbh, only for use in the birds product family. Luminous flux: 1200 lm, light efficiency: 10 lm/w, output: 120 kw/1000 h. Mean life: 1500 h. Eec c. Socket e27. The bulbs are mentioned as exception in the eu regulation 244/2009. Also: 3 x 8 w led (integrated), 2000 lm, 2700 k, cri 100/90. With built-in leds. They are not exchangeable by the user. 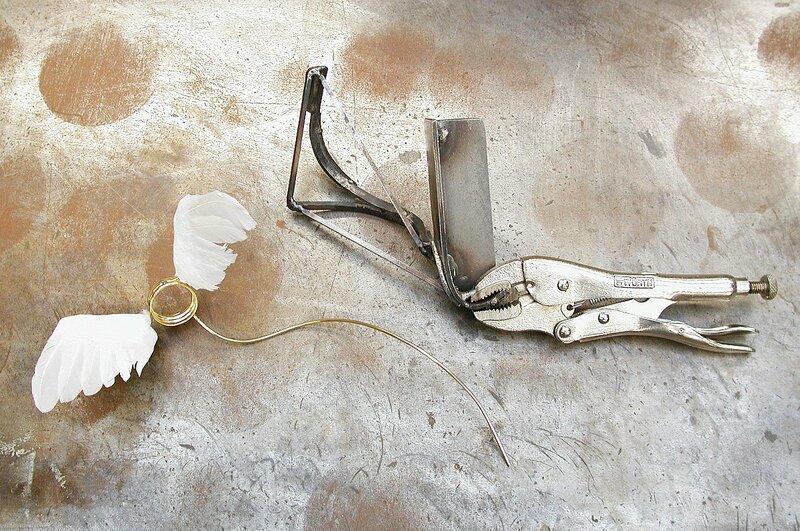 Birdie’s ring is a new member in the family of winged bulbs. It is height adjustable and can also be suspended at a slight angle. 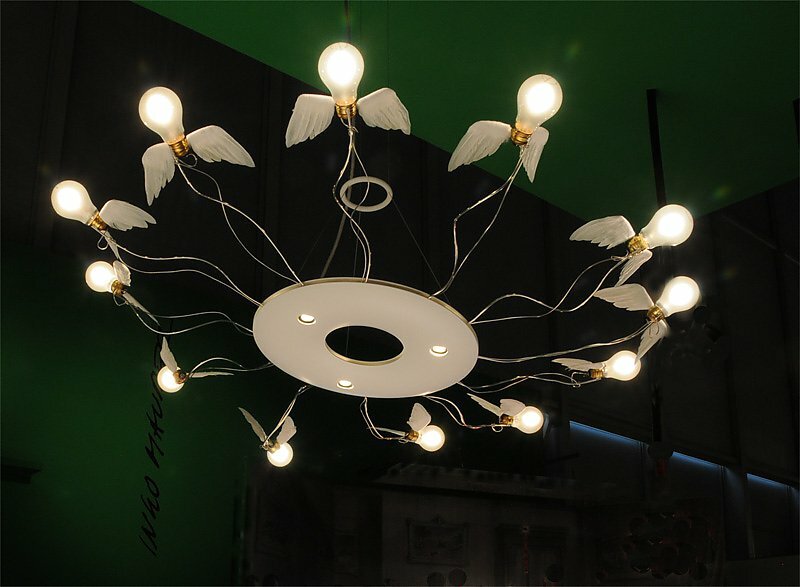 Metal, goose-feather wings, 12 low voltage bulbs. Three leds with reflectors, integrated into the round body. For 230 or 125 volts, secondary 24 volts. Integrated electronic transformer, dimmable. Diametre approx. 120 cm, length of cable 200 cm.